Ninety-three million miles from earth floats a giant fireball pumping out warmth and life 24/7, 365 days a year. Why not grab a chunk of its light to warm up your swim? Solar pool heaters are no longer just for the rich and famous. Depending on where you live, they’re an investment in your lifetime pool happiness that’ll pay handsome dividends as long as Earth isn’t dragged away into the dark by some rogue black hole. Even if you live where the moose and the wolverines play, a solar heater might be just the ticket to paying less for warm waters over time. Choose the right solar pool heater for your pool and location, and catch some savings as well as rays. The sun’s so far away that it takes light seven minutes just to reach us here on Earth. But even at that mind-boggling distance, our favorite star still hits us with more than 1,300 watts of energy per square meter. That’s enough energy to power a large microwave. No wonder we need sunscreen. Solar pool heaters work by collecting a fraction of this sunlight and using it to pump the water from your swimming pool through your filter and back. Along the way, the water passes through a group of solar collectors, warming it. Eco-friendly and affordable to operate once they’re installed, solar pool heaters are a no-brainer in hot climates. But they’re versatile enough to provide real warmth, and real value, in colder climes as well. Your initial investment might be higher with a solar pool heater. They average between $3,000 and $4,000 to buy and install, but will pay you back over time with energy savings. With an average lifespan of 15–20 years, they’re more durable than gas or heat pump models, too. The biggest potential challenge that comes with solar pool heaters is maximizing efficiency. The need for plentiful sunlight means your dream of swimming year-round in Olympia might not come true. The less sunlight your site gets, the longer you’ll have to wait for your pool to heat—and to see a return on your investment. Depending on your location, you might need to supplement your solar heater with a gas or heat pump model to keep your pool safely warmed. A solar option isn’t “plug ‘n’ play” like a standard pool heater, but don’t let that discourage you. All it takes is some careful planning and a little research to optimize your solar collection and your savings. Unglazed collectors are heavy-duty rubber or plastic panels. They’re treated with an ultraviolet (UV) light inhibitor to protect them from damage and extend their useful life. If configured to drain back into the pool when not in use, these systems are quite effective at heating indoor pools in colder climates. Glazed collectors use copper tubing on an aluminum plate and have an iron-tempered glass covering. They’re more expensive than unglazed collectors, but also more durable. Both varieties have freeze protection features to guard against cold weather. A pool filter. This familiar friend keeps debris from mucking up your pool If you click this link and make a purchase, we earn a commission at no additional cost to you. by removing it before water is pumped through the collector. A pump. 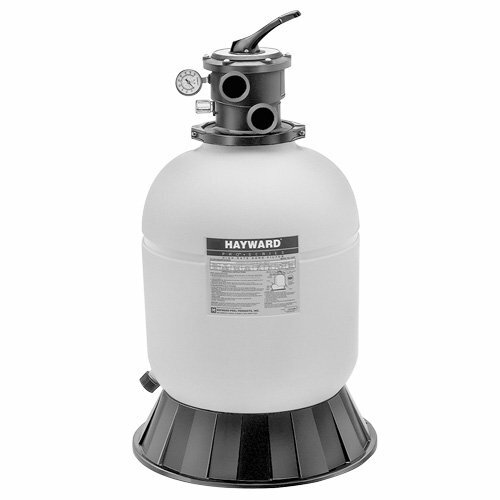 Gets things moving and pushes water through the filter and collector, then back to your pool. Because of their size, solar pool heaters need a powerful pump If you click this link and make a purchase, we earn a commission at no additional cost to you. . You might find you need to replace your existing pump with a larger one, or supplement with an additional pump to help push the water through the collector. A flow control valve.Available in automatic or manual, the valve diverts pool water through the solar collector for warming. You’ll also need plenty of sun (or one heck of a grow-light) and enough space to install the system. How Much Room Do Solar Pool Heaters Need? It would be awesome if we could capture 100% of the sun’s energy with a pocket-sized collector, but current solar tech needs more room to work. Solar pool heaters can take up a lot of space in your yard or on your roof. A good rule of thumb is what we call the Three Quarters Rule. The surface area of your solar collector will equal around 75% of your swimming pool’s total surface area. If you keep your pool open year ’round, bump that up to 100%. For example, if you have a 16 ft. ✕ 32 ft. inground swimming pool, and you live in the southern United States, plan on 100% coverage. You’ll need 512 square feet of solar collectors to heat your pool. 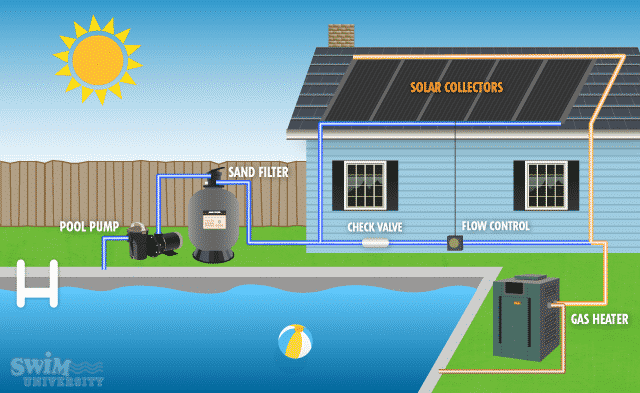 You’ll only need 384 square feet of solar collectors for your pool in this scenario. Their large footprint means solar pool heaters can end up on your roof or across the yard to make room for, well, life. 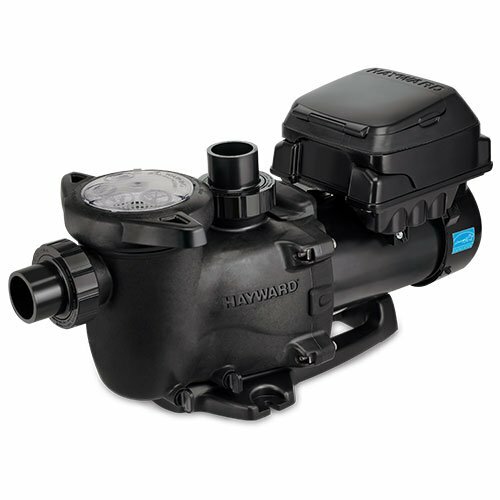 So in addition to calculating how much space you’ll need, take note of how far your collectors are from your pool—and remember to plan on a stronger pump to compensate if necessary. If installing a traditional pool heater is Intro to Math, solar pool heaters are Advanced Trig. Sure, there’s a little more work involved, but at least that pocket protector looks snazzy, right? Choosing the right solar pool heater means understanding two things: your site, and your light. The site is where you’ll be installing your system. The light is, well, the magical beams blasting from yon orb in the sky. Where you put your system, and how well it works once it’s there, will make or break your installation’s efficiency. Will your system fit in the yard, or does it have to go on the roof? Will it have plenty of sun, or will the light be blocked by trees, antennae, that miniature Colossus of Rhodes by your pool? You can mount the collectors just about anywhere near your pool, provided it has adequate sun exposure and the panels are placed properly. Both the orientation (direction the panels are facing) and the tilt (the angle of the panels) have a direct effect on performance. Solar pool heaters need their collectors oriented to maximize the amount of daily and seasonal sunshine they absorb. As a rule, true south is the ideal direction in the northern hemisphere, but you’ve got some wiggle room. Depending on your location, the collector can face up to 45° east or west of true south without dinging performance. Beyond roof orientation and any local flora, fauna, or freeways that might cast an unwelcome shadow on your solar ambitions, remember to take your local weather into account. Foggy mornings or a long rainy spring might literally put a damper on your system. A rakish tilt over one eye is fine for your vintage fedora, Daddy-O, but a solar collector’s optimal tilt varies based on your home’s geographic latitude, or position parallel to the equator, and how long you keep your pool open each year. If you’re only heating in the summer or for part of the year, tilt your panels at an angle equal to your latitude minus 10°–15°. For year-round heating, set your panel tilt at an angle equal to your latitude. If you’re not keen on March of the Sun Squares on your roofline, you can mount your collectors flat on the roof without significantly affecting performance. But don’t forget to factor the angle of your roof into your sizing measurements. Every location on Earth that’s lit by the sun has a set amount of energy available to it from that light. This is known as the site’s solar resource. How much sun your backyard gets in a day, a week, a season, or a year limits the amount of power available to solar pool heaters. They use both direct solar radiation, which is sunlight that strikes the collector directly and diffuse solar radiation, which is ambient sunlight reflected from other objects or filtered through obstructions. So even if you’re not perched on a mesa in Death Valley, your site still might have more than enough solar resource available to heat your pool. If you’re building on an unshaded, south-facing area, you’re good to go. The more sun you’ve got, the better off you are. You can always compensate for less sunlight by choosing a system with higher efficiency. If you’re not sure about how suitable your site is for using solar, or you’re not quite sure how to identify the best part of your property for the installation, get in touch with your local solar system supplier or installer. They’ll do an on-site solar resource analysis and guide you in the right direction. With solar pool heaters, make sure your budget and your goals for recouping your investment are tied to overall efficiency. You already know about orientation, tilt, and solar resources, but phytochemical efficiency is a direct measurement of how well the collectors turn sunshine into heat. Pay close attention to the thermal performance rating when you’re shopping for solar collectors. You might see this rating given in British thermal units (BTUs) per square foot per day, or BTU/ft2/day. One BTU is equal to the amount of energy required to raise one pound of liquid by one degree Fahrenheit at the temperature water has its greatest density, which is right around 39°F. You might also see the rating listed in megajoules (MJ) per square meter per day: MJ/M2day. A megajoule is NOT a lottery where you win a million butlers, but one million joules. Like the BTU, the joule is a unit of energy. And when we measure them over time, we call the power generated watts, which we all know and love (or at least know) from our power bill. Some systems might have ratings listed in BTUs/day, or MJ/day. You can calculate these values on your own by multiplying BTU/ft2/day by the installation’s total square footage, or by multiplying MJ/M2day by the installation’s total area in square meters. The higher a system’s rating, the greater its efficiency. But much like the cornucopia of potential measurement units, solar efficiency testing varies greatly due to weather, instrument failures, and human error. So if you’re comparing two systems and they’re within 25 BTU/ft2day of one another, their efficiency is roughly the same. High-efficiency systems save you money twice. They not only produce more power, but require fewer panels to hit your target heating goals. Before the first panel’s laid or the water’s turned on, you can estimate and compare the potential costs of different solar pool heaters with a little bit of math. When you know how much you need, as well as how much you have to spend, you can get the biggest bang for your buck. The collector’s thermal performance rating in BTU/day. 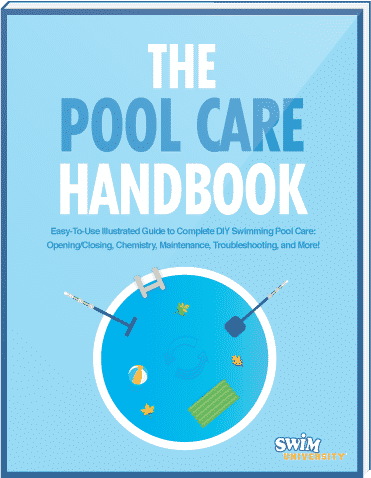 The total number of panels needed to heat your pool, based on the Three Quarters Rule (or 100% of your pool’s area if you keep it open all year). Don’t let cost be the only guiding factor in your system. Spending less on unglazed panels might save you up front, for example. But their reduced durability and performance compared to pricier glazed panels might mean more maintenance and a slower return. Less expensive panels might also require more real estate. Your garage just got a shiny new hat, and you might need to spend more on a more powerful pump to carry the heated water back to your pool. Find the sweet spot in your space, efficiency, and monetary budgets, and you’ll be ready to soak up the sun. The clouds have parted. The rains have fled. And you’re ready to embrace the sun—and solar pool heaters. Pop on your shades, calculate your site’s potential and your pool’s energy needs, and get ready to heat things up without burning up your budget. You’ll soon be walkin’, and swimmin’, on sunshine. Find out everything you need to know about liquid solar covers, what they are, how they work and why you should use them in your pool.